Maria here....It's that time of the month again! Here is one of the projects that Jessica made with the stencils. One of you lucky StencilClub winners may have a chance of receiving this piece! As a member of the club, Jessica will have a Private Member ONLY video for you when the stencils go out around the 15th of the month! 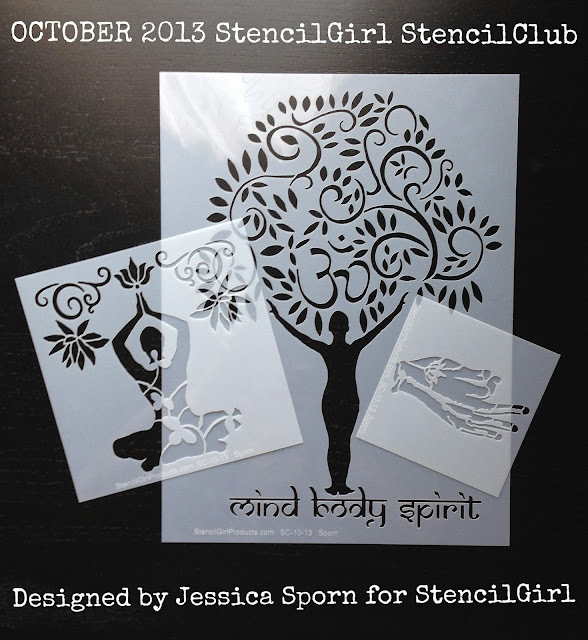 LOVE the stencils and want to know how YOU can be a member??? You can find out all about StencilClub and sign-up on our website! Hurry....if you LOVE these stencils now is the time to SIGN-UP! If you do, you will also have the option to purchase any of the previous EXCLUSIVE StencilClub stencils at member prices. Beautiful stencils, I just ordered to urly....since I live in Switzerland it will be too expensive to join the club( a pitty). Oh my! Just had to pick myself off the floor where I just fainted with pure joy They are stunningly beautiful, I am dribbling with desire! Stunning stencil designs... Cant wait to get these! Just gorgeous!!! I can't wait to get these... and what a fabulous piece of art!!!! Would be so proud to display that. Those are very beautiful. Love the designs. Johanne L.
Love these very unusual stencils - I have nothing like these in my collection! Looking forward to my Stencil Club pkg! Fabulous stencils!! My daughter is a yoga teacher and she's also an artist - she would enjoy using these; but after I use them first LOL!